What Makes Up a Great Web Strategy? It is Steve’s nature to want to plan. Every day he is drawing up technical plans for building sites and houses. These are relied upon by lots of other contractors on the project such as plumbers and electricians. They are costly to get wrong as materials and products are manufactured to his drawing specs. If the plan isn’t right, Steve has angry tradies, suppliers and clients on his hands (a sweaty, angry tradie isn’t a pretty sight). With this sort of pressure every day, he understands the value of getting the plans or the foundation right. Without a good strategy, the project is doomed to failure. So how does this relate to website strategy? Constructing a building and a website are very similar. A plan is drafted, the foundations laid and construction commences. There are always ongoing tweaks to the design but fundamentally, the building doesn’t differ from the original plan. Just like government building regulations we need to understand what rules are at play on the internet. A big part of a web strategy will be Google. It provides a large part the traffic to the website delivering qualified leads and enquiries. Think of Google as the government responsible for giving your website a tick of approval so that the building or house can be occupied. If you want your web site to be a success, you had better play by the rules. Google’s rules! In the short time that Google has been in existence it has had a profound impact on the world. Google has changed information. It gives every business owner on this planet a voice. Information is now free and it can be quickly found in just a few simple keystrokes. The word ‘Google’ has become synonymous with finding anything online. Google has the ability to transform a business. To make the world wide open to prospects everywhere. The geographic boundaries to doing business are no more. Steve the draftsman can be getting leads and enquiries for projects from Hobart through to Darwin. Unfortunately it isn’t as easy as knocking up a pretty five-page website, inserting a few pictures, stuffing it full of keywords and hoping that you end up on the first page of Google. Times have changed and Google has evolved. It is much smarter and can’t be manipulated. You see, Google wants to provide the best quality results and experience to its users. And that means filtering out all the junk websites and only focusing on sites that provide great quality content. Search engine optimisation (the process of making your website more visible in Google) is largely down to two factors – how your website has been constructed (on-site optimisation) and the content contained within. Building a great looking website is only the start. Google wants much more than that. It wants quality content, and plenty of it. You see, the search giant has succeeded by building a really great product – its search engine. This is why it has such a dominant market share. They pride themselves on serving up the most relevant results to a search query. The website that takes the time and effort to provide quality content relating to their products and services wins. Number 1 position in Google (or as close as possible) is the goal. It is as simple as that. There is only one number 1 position in Google (pretty obvious really!). You can be sure that every one of your competitors is competing for that spot. In fact, when someone does a search, number 1 position roughly gets over 30% of all the click throughs. Number 2 around 20% and number 3 position, 10%. The top three positions make up around 60% of all clicks. So your site had better be on the podium otherwise you are missing out on the lion’s share of web traffic. Rarely will a user go past the first 10 results so if you are not on the first page, you are virtually invisible. Steve the draftsman is sitting on a mountain of knowledge. He knows his industry back to front. He has been doing it for years and knows all the tips and tricks and ins and outs. There are two approaches Steve could take. One is to only share this information with people who pay for it (the customers he sends invoices to). The second is to be proactive and openly share this wealth of knowledge with absolutely everyone. No industry secrets, no hiding behind the cloak of mystery. Just openness and transparency about Steve’s approach, process, methodology, learnings, hacks and advice. Your website becomes the ultimate platform to share this plethora of information – usually on your blog. It can be done via a content strategy in a variety of ways such as blogging, video or even podcasting. This method is called ‘content marketing’ which is founded on openness, transparency and sharing. Using the ‘content marketing’ approach, it can build you as an authority in your industry as you are taking a leadership role. Prospects are naturally ‘pulled’ to you instead of having to ‘push’ your marketing on them all the time. No more relying on newspaper advertising or the Yellow Pages. Customers will naturally seek you out as they want your product. You become a brand authority, an opinion leader with a voice. You make it easy for a prospective customer to find and purchase from you. As you become more proactive, existing customers purchase more often. Past customers re-engage and become clients for life. Best of all, it is a cheap and effective way of marketing your business. Your challenge is to construct a powerful way to communicate (for our purposes, it’s your website) and share this with your tribe. News draws people in. By founding your online strategy with a news-based website you give your business the perfect vehicle to communicate with prospects, customers and past customers. The approach is to develop a consistent routine creating awesome quality, highly valuable content that is posted on your website. Google will find and then reference this content in their search engine results. When a prospective customer is looking for an answer to their question, the initial thing most people do is visit Google and type the first thing that pops into their head, for example “What is the difference between an architect and a draftsman?” Because your website is now a trusted authority (and contains the answer to their question), Google rewards you with page one listings and sends leads and enquiries to your website. It is almost like having your own little newspaper. Content is limitless. Every business and industry has so much to talk about. The inherent nature of business is that there is always change. Things such as industry trends, legislation, rules, procedures, technology – it never ends. As a business owner, take the leadership role and provide updates and commentary on what’s happening and why. But just like a traditional newspaper, the content must be interesting, targeted and useful otherwise people won’t read and get in touch. Online, there is so much noise and choice in the market place and your window of opportunity is narrow. You have a very limited amount of time – just three seconds – to make an impression otherwise the user moves on. Prospects will naturally gravitate towards the business owner who creates content that solves their problems and presents this within a well structured website format. There are so many different types of content you can create. For more detail, go to Chapter 5 but the most engaging and personal content by far is creating ‘face to camera’ videos. It is so easy for any business owner to produce good quality video and post it on their website. More on this later. The important thing is to categorise your content into ‘segments’ (this can easily be done via ‘Categories’ in WordPress). The benefit of doing so is all your content is grouped together in a logical fashion ensuring you are having the most relevant conversation with the most appropriate person. Think of it much like the different ‘sections’ within a newspaper such as the business, sports, weather or world news and how you react and read. Just as you tend to go for the interesting (to you) stuff, so too will your reader – and thank you mentally for your thoughtful navigation guides. Another added bonus is that all the content created can be reused. This means getting maximum leverage from one task or activity. The audio can be stripped from your video, and converted into a podcast (your own little radio station). The text can be transcribed and placed beside the video which will be found by Google. Your new video can be shared via email marketing and social media. This gives you the opportunity to connect with visitors in many different locations via the channels they most respond to. The best part of all is there is no reliance on any one platform as a traffic source to your website. Provided your content is engaging, you can ask your prospects if they would like to see more of that type of news. Assuming it is, they will happily hand over their email address through a cleverly placed ‘email opt-in’ box. The priority is to capture details of people not on your database. Once you start collecting email addresses it is easy to build a strong, segmented email database. By then emailing that prospect on a regular basis, you can start building a relationship by consistently staying front of mind. The end result is a front end sales machine that drives targeted traffic to your business. Marketing costs go down and profits go up. You increase your industry visibility and you start to be noticed by other media, perhaps who might require a quote from an industry spokesperson at some point. There are no downsides! Increase the number of new customers – A news-based system keeps your customer funnel always full. New people find you day in, day out. Sell more to your existing customers – By communicating with your existing customers you keep them abreast of changes in your business including new products and services. They are aware of what you have and you remain front of mind. Increase your prices – By being on the front foot in an authoritative leadership role, you are seen as the expert. In turn, it is much easier to charge more for your products and services. Now you understand the importance of a website founded on great content. No two web strategies are the same but common elements exist. Here is a sample of what a typical small business ‘online footprint’ would look like. This book is focused on the hub or the central component of how your website can be built using a self-hosted tool called WordPress. WordPress is free-to-use website software that enables you to build a beautiful website. It is a publishing platform that gives most business owners all the tools they need to succeed online (more on WordPress in Chapter 3). WordPress can be modified or extended through the use of plugins to add extra features or functionality such as social media sharing, shopping carts, search engine optimisation and many more. It can be shaped and moulded to your specific requirements. So building a three-page website and hoping you are sitting in number 1 position isn’t going to cut the mustard with Google. It wants more. Much more. For your website to do well and generate highly qualified of traffic, it wants content (and lots of it!). A good web marketing website comes from good planning. Google has changed the game and you need to understand what it wants. The key now is frequently updated valuable content that is relevant. Trying to game Google with keyword stuffing doesn’t work. The top three positions in a search page account for 60% of eventual click throughs (you need to be there!). A good webpage ‘pulls’ in prospective customers and builds you as an authority in your industry. Treat your website design as a mini publishing effort and aim to educate and add value for your prospects. Move towards having an online footprint (combining social media, email marketing and offline activities), not just a website. 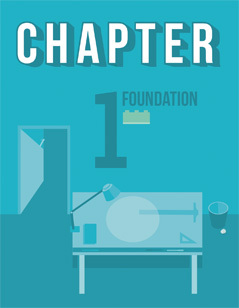 In Chapter 2 we will set about finding a web designer to help you build your brand spanking new WordPress website. Let’s get to it.